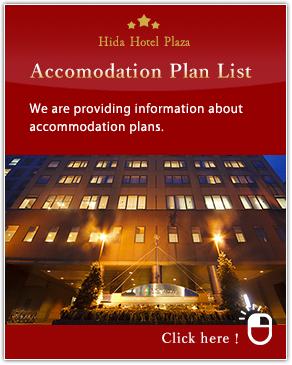 Hida Hotel Plaza is located two blocks north and a five minute walk from both the JR Takayama Station and the Takayama Bus Center. From the hotel itself, it is only approximately a 15 minute walk to the main tourist facilities of Takayama City. Rental bicycles are always available. In pleasant weather, you can cycle around the city at your leisure, visiting a myriad of interesting and wonderful sites. A simple 10 minute bicycle ride brings you to historical temples and to beautiful Higashiyamatera-machi, a town rich in nature. ・Please purchase tickets promptly after reservation. ・Round-trip tickets are not available for sale at buses. ・All buses are equipped with a bathroom. ・Please fasten seatbelts while riding buses. How to get to Takayama from Kanazawa, Toyama,Shirakawago. ・Some buses require a reservation. ・For non-reserved seat buses, please purchase a ticket before you take the bus.